Here are Some Ideas to Create that Perfect Shot! Baby's Photo (within 1 month from the date of submission). 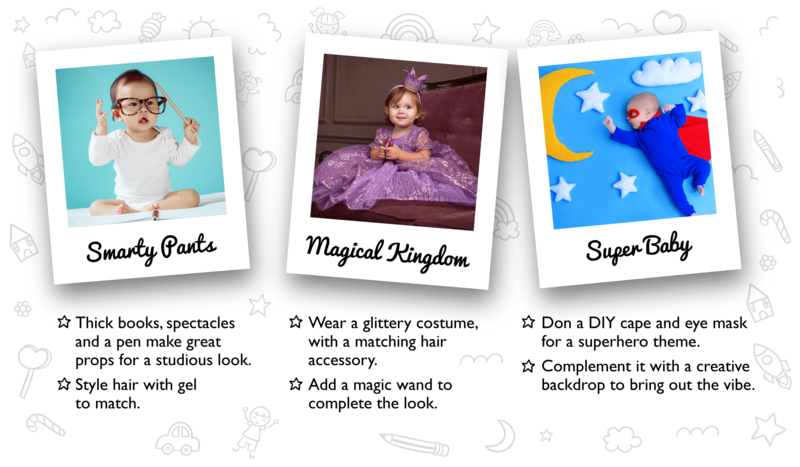 Share your brightest star in one theme: Super Baby, Smarty Pants or Magical Kingdom. Is this contest organised by AEON BiG? Which AEON BiG Hypermarket you usually shop at? 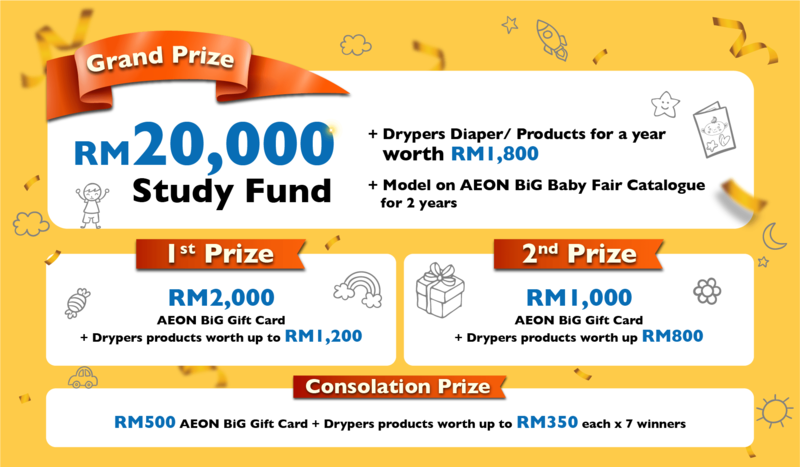 AEON BiG receipt with RM100 spend on baby diapers & toiletries with min. 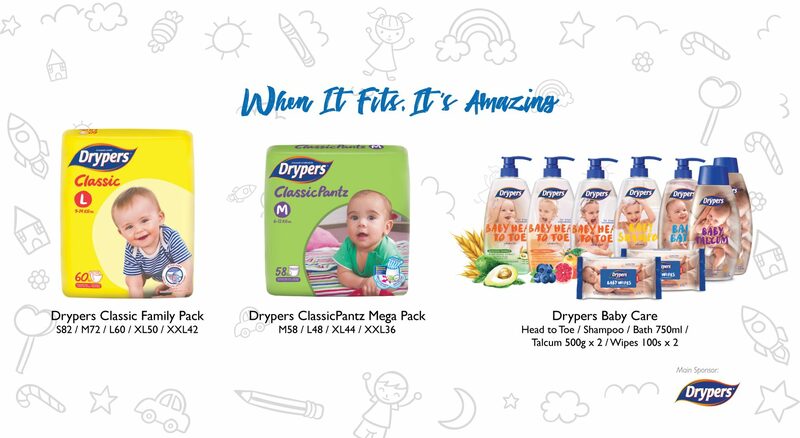 one (1) Drypers diaper & one (1) Drypers toiletry worth RM30 in a single receipt. 1.1 AEON BiG Little Star Search Vol. 4 (“Contest”) is organised by AEON BIG (M) SDN. BHD. (“Organiser”) in partnership with Vinda Marketing (M) Sdn. Bhd. (“Partner”). This contest will commence on 12th April 2019 and will conclude on 23rd June 2019 both dates inclusive (“Contest Period”) at all AEON BiG Hypermarkets. Any entries submitted after the Contest Period shall not be entertained by the Organiser. 1.2 By participating in this Contest, you hereby expressly agree to be bound by all the terms and conditions below (‘Terms and Conditions’). 2.1 This Contest is open only for toddlers between 12 to 24 months old as of 12th April 2019. 2.2 Participants must either be the parents or legal guardian of the toddler. At least one (1) parent or legal guardian must be a Malaysian and currently residing in Malaysia (“Participants”). In the event, a participant submits an entry that does not conform to this clause, the entry will be disqualified. 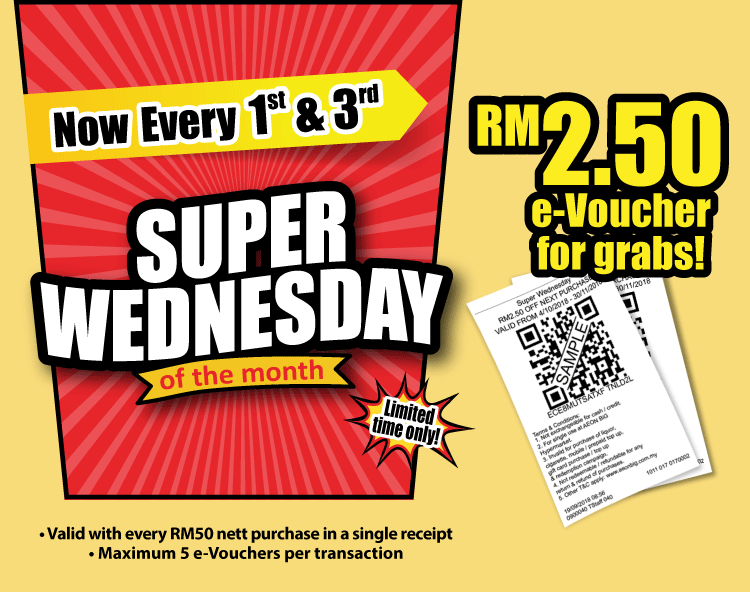 2.3 This Contest is available at all AEON BiG Hypermarkets nationwide. 2.4 Participants may only join the contest in Malaysia and entries originating from any other countries are not eligible. 2.5 AEON BiG and Partner’s employees (including its respective subsidiaries), agencies, dealers, distributors, sponsors and respective immediate family members are not eligible to participate in this Contest. 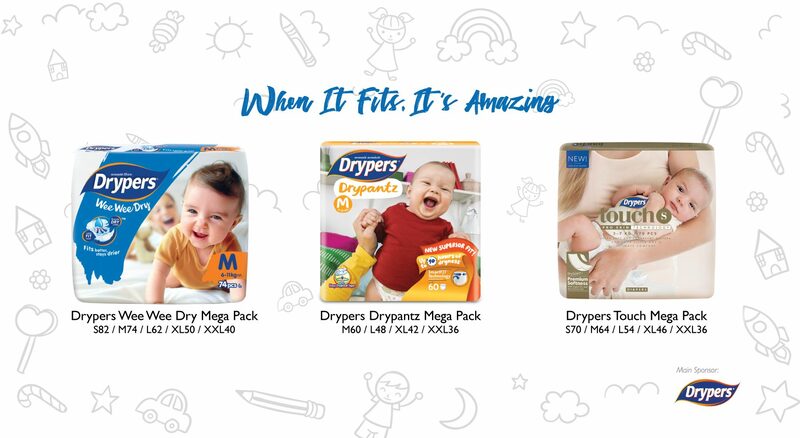 2.6 To participate in this Contest, Participants are required to perform a minimum purchase of RM100 on baby diapers or toiletries with minimum one (1) Drypers diaper and one (1) Drypers toiletry worth RM30 in a single receipt at any AEON BiG Hypermarkets nationwide (“Purchase Criteria”). Any ineligible purchase will be disqualified. 2.7 The Organiser reserves the right to reject any entries or disqualify any Participants without assigning any reason. 2.8.2.1 Participants to provide toddler’s details as per Malaysian Identity Card, MyKid. 2.8.2.2 Parents or legal guardian of toddler to provide details as per Malaysian Identity Card, MyKad. 2.8.3 Upload a clear colour photo of the toddler which is taken within one (1) month from date of submission in one of the following themes; Super Baby, Smarty Pants or Magical Kingdom. 2.8.3.1 Participants to ensure that the attachment of photo must not exceed 5MB in size. 2.8.3.2 Participants to note that the uploading process may vary depending on the volume of entries at any time. 2.8.4 Participants are required to answer two (2) simple questions. 2.8.5 Participants are also required to upload the proof of purchase (“AEON BiG Receipt”). Only original printed receipt with proper item description will be accepted. Duplicated and reprinted receipts are not allowed. 2.8.6 Participants need to click “Submit” button after they have read and agreed to the Data Protection and Privacy Notice. 3.2 The Organiser reserves the right to substitute prizes with other prizes of similar value without prior notice. 3.3 Prizes are given on an ‘as is’ basis, and are not transferable, not exchangeable for cash or kind whether in part or full. 4.1 At the end of the contest period (Round 1), thirty (30) toddlers will be shortlisted to Round 2 by the Organiser and the panel of judges. 4.2 All thirty (30) shortlisted toddlers will receive an email confirmation for verification and consent purposes prior to their entry to Round 2. 4.3 The Organiser will create a physical public voting platform by printing all thirty (30) shortlisted toddlers’ photos at AEON BiG Hypermarkets Nationwide. 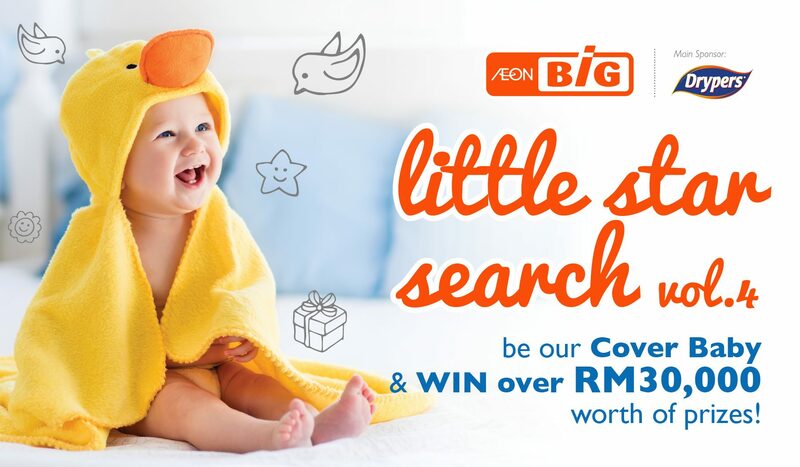 4.4 The public voting is open to all AEON BiG customers to vote for their choice of toddler with a minimum purchase of RM60 and above in a single receipt. 4.5 Customers who voted will stand a chance to win surprise gifts when the toddler they voted for advances as the Top Ten (10) Finalists. 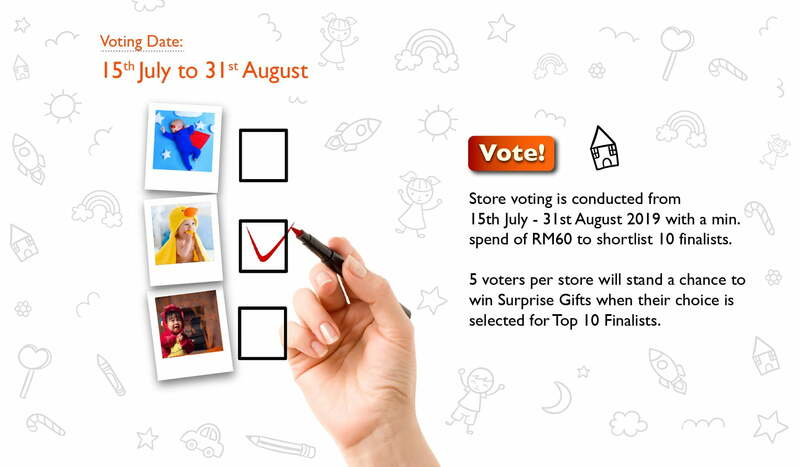 4.6 Customers who have voted shall only be entitled to one (1) prize each, regardless of the number of votes. 4.7 For Round 3, the Top 10 Finalists will be contacted and invited to ‘The Finale’ which the details of the event shall be confirmed by the Organiser. The 10 Finalists will be contacted by the Organiser and the Organiser will attempt to contact the Finalists up to two (2) times during regular business hours via phone. The Organiser shall not be held accountable in the event if the shortlisted finalists cannot be contacted for whatsoever reason. 4.8 The Finalists shall bear their own travelling and personal expenses to attend ‘The Finale’. 4.9 Failure to attend ‘The Finale’ event will cause the eligible finalist(s) to be disqualified from the event and any prize. 4.10 The Grand Prize, 1st Prize and 2nd Prize winners are required to fill up the order sheet and return to the Organiser within fourteen (14) days after the event for the delivery arrangement of the winning prize. This delivery will only be done one (1) time directly to the winners’ residence. 5.1 Participants may submit as many entries they wish provided that each single receipt as explained above qualifies for one entry. The photo submitted cannot be older than twenty-four (24) months as at 12th April 2019. 5.2 Photo submitted shall be in full colour. 5.3 Participants must not submit photos that involve the willful harassment or violation of privacy of any person or property or put any individual in danger or infringe on the rights of any other photographer or person. Any photo deemed inappropriate or unsuitable for the Contest, in the Organiser’s sole discretion, will be disqualified from the Contest. 5.4 If the Participant is not the guardian/parent of the baby, the Organiser shall presume the legal guardian/parent has given verbal/written consent to the entrant by the time Participant posted the Entry on AEON BiG website. The Organiser will not be responsible if the Participant posted the Entry without the knowledge of the legal guardian/parent. In the event the legal guardian/parent lodges complaint to the Organiser for posting photo of their baby without their consent, the Organiser will disqualify the Entry and will remove it from AEON BiG official website. In the event whereby the Participant is not the parent/legal guardian and won the Contest, a written consent from the parent/legal guardian will be required during ‘The Finale’ event. 5.5 The Grand Prize Winner will be required to be available for a full day shoot on a day to be advised. The Organiser shall not bear any costs arising from the travelling and accommodation of the child and one (1) supervising parent or guardian howsoever with regard to the photo shoot session. 5.6 The parent or guardian of the Grand Prize winner is required to sign and return a letter of release and/or other confirmatory documentation on behalf of the toddler, as determined by Organiser in its sole discretion, to give permission for the images to be used for promotional, advertising and publicity activities for Organiser within a period of 24 months from the date of finale event. 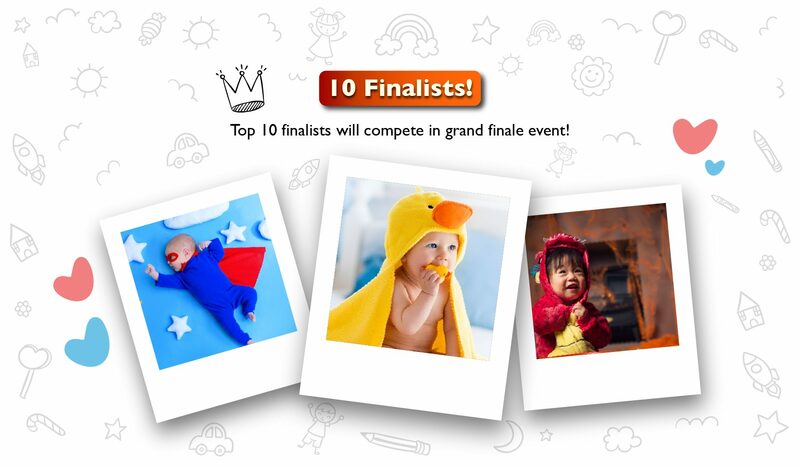 5.7 Photos of all the winners of the Finale event cannot be used in any publication or advertisement for baby products without the prior approval of the Organiser. 5.8 Prizes are not exchangeable for cash. The Organiser reserves the right and absolute discretion to change the prizes advertised with prizes of a similar value and such changes shall be notified to winners by the Organiser. 5.9 Any noncompliance to the contest’s Terms and Conditions may result in immediate disqualification in this Contest. 5.10 The Organiser reserves the right to re-judge in the event of an entrant, claiming to be a winner, being unable to satisfy these Terms and Conditions. 5.11 The Organiser reserves the right to withdraw any entries where unfair or illegitimate practices are suspected. 5.12 The Organiser reserves the right to request winners to provide proof of identity, proof of residency, proof of age of the baby in the form of birth certificates and My Kid in order to claim a prize. Proof of identification, residency, age and entry considered suitable for verification is at the discretion of the Organiser. In the event that a winner cannot provide suitable proof, the Organiser reserves the right not to surrender the prize in whole or in part and no substitute or compensation will be offered. 5.13 The Organiser reserves the right to publish or display or the winners’ names and/or photographs of the winners for advertising, publicity and/or trade without further compensation or notice and each Participant is not entitled to make any claims for the use of their entries by the Organiser. 5.14 The Organiser, Partner the and its entities assume no responsibility and shall not be held liable for any accident, harm, damage, losses (including but not limited to indirect or consequential loss) or charges, injuries, unforeseen circumstance, and any inconvenience or any other liabilities of any nature whatsoever arising through participation of this Contest or in connection with the fulfillment of any prize, nor for any changes in dates or in times or cancellations which may prevent the selected winner(s) from taking the original prize offered or any part of the prize, or for lost or stolen prizes. 6.1 The Organiser, Partner, its agencies, affiliates, sponsors and representatives are not responsible for defective prizes or misuse of any prize, or claims, liability, loss or damage arising out of or in connection with this Contest. 6.2 All entry instructions and any other specific requirements relating to the Contest or the prizes (if any) form part of these Terms and Conditions. By entering the Contest, the Participants will be deemed to have read and understood the Terms and Conditions and specific requirements therein (if any) inclusive of the Data Protection & Privacy Notice as detailed below, be bound by them and abide by the decision of Organiser. 6.3 The Organiser, Partner and its entities involved are not responsible or liable for any error, omission, interruption, deletion, defect, delay in operation or transmission, communications line failure, theft or destruction, unauthorized access to, or alteration of, user or member communications, or any problems or technical malfunction of any telephone network or lines, computer online systems, servers or providers, computer equipment, software, failure of e-mail on account of technical problems or traffic congestion on the internet and/or websites. 6.4 Participants release the Organiser, Partner and its affiliates, as well as all others associated with the development and execution of this Contest, from and against any and all liabilities with respect to or in any way arising from this Contest and the awarding and use, misuse or possession of the prizes, including liability for any personal injury or death except where prohibited or limited by law. 6.5 The Organiser reserves the right to modify, annul or rescind the terms of the Contest without further notice. The Organiser’s and the judges’ decision on any matter concerning the Contest is final with respect to any aspect of the Contest, including the determination of the winner(s) and selection of photos to be featured in magazine or in any form. No challenges to the selection of winners will be entertained. 6.6 The judges’ decision is final and conclusive, and no further correspondence, queries or appeals shall be entertained. 6.7 The Terms and Conditions of this Contest shall be governed and construed in accordance with laws of Malaysia and the exclusive jurisdiction of courts of Malaysia. 6.8 Time shall be of the essence of this Contest. Your personal data including your name, NRIC number, contact details, email address, address, and TR number (to attach receipt for verification) which you have provided in your application to participate in this Contest including any publicly available information available on social networking websites will be recorded, stored or otherwise processed by AEON BiG for purposes relating to the Contest and for related advertising, publicity, marketing and communication relating to AEON BiG (“Purpose”). Please be informed that your personal data may be disclosed to AEON BiG's affiliates, service providers and relevant business partners (if any) for the Purpose and as permitted by applicable data privacy laws. You may request for access to or correction of the personal data, submit inquiries or complaints, or limit the processing of the personal data at any time hereafter by submitting such request to AEON BiG via e-mail at dataprivacy@aeonbig.com.my as the case maybe. Please note that it will be necessary for AEON BiG to process your personal data for the Purpose, without which you will not be able to participate in this Contest. Maklumat peribadi anda termasuk nama anda, nombor Kad Pengenalan, maklumat perhubungan, alamat e-mel, alamat, dan nombor TR (kepilkan resit bagi tujuan verifikasi) yang anda berikan dalam permohonan anda untuk mengambil bahagian dalam Pertandingan (Contest) ini, termasuk apa-apa maklumat umum yang boleh didapati di laman web rangkaian sosial akan direkodkan, disimpan atau diproses oleh AEON BiG untuk tujuan yang berkaitan dengan pengurusan Pertandingan dan untuk pengiklanan, publisiti, pemasaran dan komunikasi yang berkaitan dengan AEON BiG ("Tujuan"). Sila ambil maklum bahawa data peribadi anda mungkin akan didedahkan kepada sekutu AEON BiG, pembekal perkhidmatan dan rakan perniagaan yang berkenaan (jika ada) untuk Tujuan tersebut dan sebagaimana yang dibenarkan oleh undang-undang data privasi yang berkenaan. Anda boleh meminta akses atau pembetulan data peribadi anda, mengemukakan pertanyaan atau aduan, atau mengehadkan pemprosesan data peribadi anda pada bila-bila masa selepas ini dengan mengemukakan permintaan itu kepada AEON BiG melalui e-mel ke dataprivacy@aeonbig.com.my. Sila ambil perhatian bahawa kami perlu memproses data peribadi anda untuk Tujuan tersebut, jika tidak anda tidak akan dapat menyertai Pertandingan ini.